Leaving our mark | Blog the world!!! It’s nice to leave your mark on a place. Since we’ve been travelling we’ve tried to do this where we can – in Chandigarh there’s a painter painting our portrait, as a group we tried to educate a tour guide in Jaisalmer about why plastic water bottles shouldn’t be burnt in the desert, we taught English to children and gave staff a workshop on report writing in Phnom Penh and I’d like to think that, in a small way, we helped the cause at The Elephant Nature Park. But we couldn’t be prepared for the significant way in which Gemma was to leave her mark in Hanoi. It was like fate. Oh, and in Goa I broke a toilet. As Gemma mentioned in her last blog, we were in Hanoi to visit our friend Tatch. Tatch and his friends are all full time (20 hours a week is considered full time there) English teachers and so in an undeniably important way, they’d already left their mark on Hanoi, and continue to do so. Although we definitely are tourists, and we have the huge backpacks and eager but weary faces to prove it, we didn’t really do Hanoi in the touristy way. We were living with the locals (albeit English ones) in a non touristy area slightly to the south of the main city centre. Other than our hosts, no one in the area spoke English and our Vietnamese was, and still is, non-existent. This might sound like a nightmare, but it was actually quite refreshing. Shop staff, street shavers and passers by all went out of their way to help us and make us feel at home. One morning on the way back from the shop a middle aged lady accompanied me and we managed a fairly long and funny conversation considering neither of us understood each other. 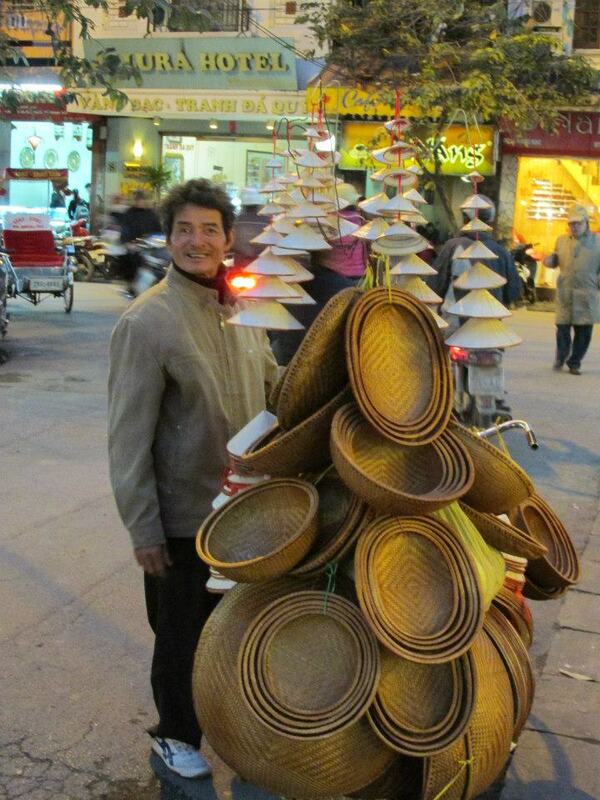 It’s easy to warm to the Vietnamese people. It was however the ex-pats of Hanoi who we were to spend most of our time with. There are a lot of them, they all know each other and they all live like rock stars. Every night was spent either sharing a few beers, enjoying Vietnam’s genuinely fantastic food or partying in one of their elaborate houses. Ridiculously welcoming and friendly as they come, it felt like we’d been living with them in Hanoi for years. The teaching hours in Hanoi also means they all have a lot of free time on their hands. One guy had started to learn to play piano, one girl spent time cooking fantastic feasts and, well, some of them had got really good at FIFA. Tatch had spent the last couple of years organising an art movement called ‘doodle jam’ where (as far as my understanding goes) artists come to events to decorate walls with pictures. It seems to have taken off, and with that, he’s left an even bigger mark on Hanoi than he ever could have imagined. But this still does not compare to the magnificence of what Gemma was yet to do. Hanoi provided us with water puppets, exhilarating motorbike rides, a drum n bass night, outstanding food, a museum, a walk around the old town, 12p beer and finally, some good old fashioned English tea. I was fascinated by the animals fried in their entirety for sale at the side of the road, the sheer amount of maternity shops and the way in which each restaurant only served one dish. But what interested me most was the way in which the people of Hanoi handle the three months of winter they face each year. It’s not a long winter but it rivals England when it comes to temperature. Everyone is clad in huge puffa jackets and furry hats, the toddlers wear puffa onesies which make them look like walking stars and we wore 4 of Tatch’s housemates jumpers each. But because winter only lasts 3 months few of the houses in Hanoi have heating, instead everyone just keeps all their winter wear on inside and spend as much time wrapped up in bed as possible. It’s survival at its most fashionable! The day before we left we went with Tatch’s housemate Kim to a museum, but first, on the way, he needed to extend his Visa in the old town. After a few seconds he came out of the visa office looking slightly confused to tell Gemma there was a lady in there who wanted to ‘borrow her’. Intrigued we went in. Now, I don’t know how big a business financial advice is in Vietnam. I don’t know how many English speaking businessmen and women think of Hanoi as the place to go to manage their financial situation. However, thanks to that lady, now if you ring ASA financial services, you’ll hear Gemma putting on her best posh accent (which, for those of you who’ve heard her do this will know, is quite hilarious) and directing you, through the buttons on your handset, to the department you require.